Savin C, Tkacik G. Estimating nonlinear neural response functions using GP priors and Kronecker methods. In: Vol 29. Neural Information Processing Systems; 2016:3610-3618. Chalk MJ, Marre O, Tkacik G. Relevant sparse codes with variational information bottleneck. In: Vol 29. Neural Information Processing Systems; 2016:1965-1973. Tkacik G. Lecture notes for 2010 summer school on Quantitative Evolutionary and Comparative Genomics. In: Elsevier; 2010. 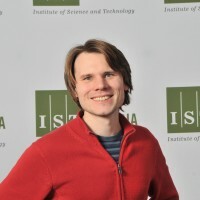 Tkacik G. From statistical mechanics to information theory: understanding biophysical information-processing systems. ArXiv. 2010;q-MN:1-52. Tkacik G, Schneidman E, Berry M, Bialek W. Spin glass models for a network of real neurons. ArXiv. 2009;q-NC. Broderick T, Dudik M, Tkacik G, Schapire R, Bialek W. Faster solutions of the inverse pairwise Ising problem. ArXiv. 2007;q-QM. Tkacik G, Schneidman E, Berry M, Bialek W. Ising models for networks of real neurons. ArXiv. 2006:1-4. Slonim N, Atwal G, Tkacik G, Bialek W. Estimating mutual information and multi-information in large networks. ArXiv. 2005:1-11.